Milan Lucic wants to stem the tide for the Edmonton Oilers before they rack up too many losses and it becomes a lost season. 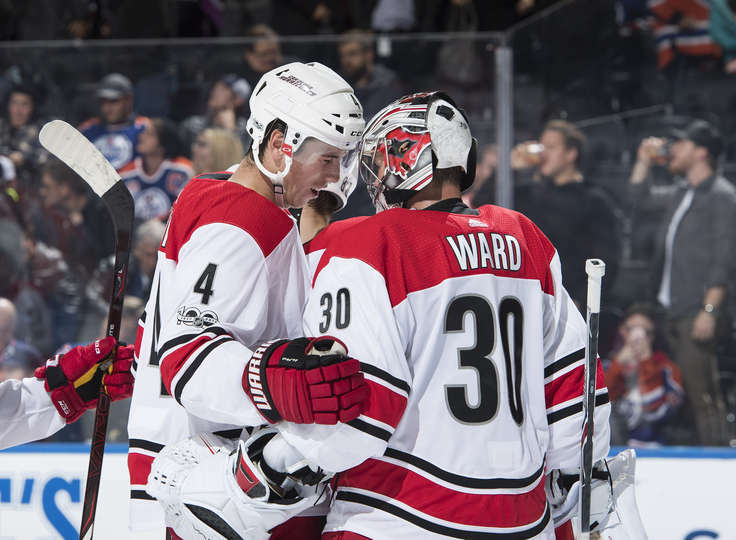 Teuvo Teravainen had a pair of goals and Jordan Staal a goal and three assists as the Carolina Hurricanes scored early and didn't look back in a 5-3 victory over the Oilers on Tuesday. Mark Letestu, Ryan Strome and Milan Lucic replied for the Oilers (1-4-0), who have now lost four in a row. "Sixteen goals allowed in our last three games, that's not going to do it," Lucic said. "It doesn't matter who we have in net. We have to get better at not making stupid mistakes. "You have to stop the bleeding before it gets really bad and you dig yourself too big of a hole that you can't get out of. There is 77 games left, and we can keep saying that, but as long as the losses keep piling up, it is going to be a long year." Oilers captain Connor McDavid said nobody should be freaking out about their start yet. "It's five games in and nobody's on the panic button here," he said. "I'm sure there will be doubters now but we still believe in this room, obviously. It's a little bit magnified because it's the first five games. If we go through the season with a 1-of-5 stretch in February, it's not good but it's not as talked about as it is now." Elias Lindholm and Jaccob Slavin also scored for the Hurricanes (2-1-1), who snapped a two-game losing skid. "Coming out with 3-0 lead after the first is always nice, Staal said. "We made it interesting again, but we'll continue to learn from those ones. They're a very dangerous team so they can make a push back and they did a good job of trying to climb back into it. But I thought (goalie Cam Ward) ended up finishing them off at the end." Teravainen elected to shoot on a two-on-one break, beating Oilers backup Laurent Brossoit stick-side for the first goal of the game just 20 seconds into the period. He staked his team to a 2-0 lead five minutes later on the power play, blasting a shot from the top of the circle up high and past Brossoit. Carolina took a three-goal lead on another power play with 1:20 remaining in the opening period. Staal made a nice feed across the crease to Lindholm, who had a wide-open net to deposit the puck into. Letestu banged in a rebound in tight past Ward, who was making his first appearance in net this season, to make it 3-1. The Hurricanes regained their three-goal edge four minutes into the third period as Staal picked off a pass and scored on a short-handed breakaway. Strome tipped in his first goal as an Oiler past Ward to make it 4-2. The power-play goal came a minute after Staal's. The Oilers pulled to within a goal eight minutes into the third as Lucic beat Ward with a slapshot. Carolina ended the comeback bid two minutes later as Slavin undressed Brossoit with a deke. Staal picked up his fourth point of the night and of the season on the play. Ward was credited with 48 saves in the win, as the Oilers outshot Carolina 51-21. "We certainly scored enough to win and fortunately I was seeing the puck real well and held the fort," Ward said. NOTES: Oilers forward Leon Draisaitl remained out with an eye injury/concussion symptoms. ... Center Martin Necas, selected by 12th in the 2017 NHL Draft by Carolina, made his NHL debut. Hurricanes: visit Calgary on Thursday. Oilers: play at Chicago on Thursday.